a book chick: "Baltasar and Bluminda"
my take: Walking through Portugal I was amazed at the scale of their oldest buildings and monuments. It put me in mind of the pyramids: as in slave labor. These things don't get built by the people who dream them/demand them/use them. They get built by captives and those vulnerable to the wealthy and powerful. Baltasar & Bluminda tells the story of the convent at Mafra (a bit north of Lisbon) from it's inception to (premature) consecration. Oh, kids. This is brutal and beautiful. Baltasar is a maimed former soldier, Bluminda is a young woman orphaned by the Inquisition, the King is Joao IV who needs an heir, and the fellow who inspired the tale is remembered as the "Flying Priest". The contrast between the wealthy and the poor couldn't be more pronounced. The contrast between the characters couldn't be harder to distinguish: no quotation marks and not even paragraph breaks to indicate a new speaker. This was slow reading. Which gave me time to ponder better. A very relevant book for our times of rich versus poor in the United States and world wide. my source:While prepping for a trip to Portugal I found a suggestion to read El Convento... I downloaded a $5.99 copy to my kindle & opened it to read on the airplane. EN PORTUGUESE! Rats! 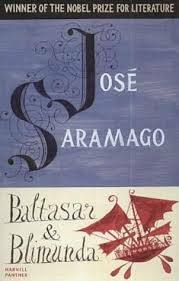 I hunted down El Convento in Porto at a really great bookstore ... the salesgirl told me they didn't have it but they had this in English and it's her all-time favorite book, not just her favorite José Saramago book. Well! Sign me up! A couple cities later at another bookstore I asked after El Convento and was handed Baltasar & Bluminda. Ta da! Same same. my verdict: Slow-going excellent read for those going to or have been to Portugal. Thanks for the recommendation! I am heading to Portugal next month and have been looking for a Portugal-related book to read. I have read Blindness (which took me forever because it's so heavy.. I literally put it down for months at one point.) I believe I already own this one so I will track it down and get started. Guessing I'll have to go visit the palace after reading the book! Yes! A visit for sure to Mafra. Only wish I'd planned ahead.